Local lawyers who can assist you with: will - trust - estate planning. Click here to names & websites. Click here for more information Honoring Choices Minnesota to launching thought, conversation and planning. In the late 1950’s, the Evangelical United Brethren Conference identified Inver Grove Township as a possible site for a new mission church and on Dec. 18, 1960 Mt Bethel Church opened for worship with 33 charter members. The first service in the new building began with a caravan from Old Salem Evangelical Shrine, where they had been worshiping. Dedication was held on January 22nd, 1961 with the Rev. Omar Hardin presiding. In 1968, the merger of the Evangelical United Brethren and Methodist Conferences created the United Methodist Conference and the name was changed to Mount Bethel United Methodist Church. Numerous building projects have been completed over the years with many industrious members working together. 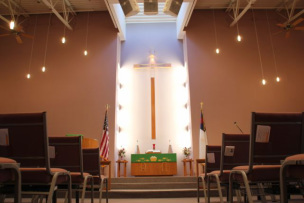 In 2003 a new sanctuary and classroom addition were completed, including an elevator. The dedication was held on September 12th, 2004 with Bishop Sally Dyck presiding. Local lawyers who can assist you with estate planning. Click here to names & websites. A planned gift is a financial or charitable commitment made now which results in a future gift. It is a way to invest in the future of Mt Bethel Church for the benefit of current and future members and our community. Our first responsibility is to care for our families and our church’s current needs. The Planned Giving program allows for additional gifts to be provided for the future. If the Lord has blessed you with additional resources, we encourage you to consult with your attorney or financial planner to decide on the most appropriate strategy for your situation. A bequest through your will, designated or undesignated, that a dollar amount ($) or percentage (%) of your estate go to the Mt Bethel Endowment Fund. Name Mount Bethel Endowment Fund as a beneficiary on a life insurance policy. A gift of an appreciated asset such as stocks, bonds, real estate, etc.. Create a Charitable or Revocable Trust or Charitable Annuity. A cash donation of any amount given now to help establish the new Endowment Fund. Mt Bethel Church established an endowment fund to invest in the future of Mount Bethel United Methodist Church. A donation at the present time or a designation in your will of a dollar amount or percentage of your estate, would help to ensure the future of our church. Contributions designated for placement into the Mt Bethel Endowment Fund would be invested in secure assets to help to build the fund. After the initial Endowment Fund goal of $50,000 has been reached, only the earnings would be used for special projects or major expenses designated by you (the donor) and approved by the Administration Board of Mount Bethel United Methodist Church. The original principal amount placed in the Endowment Fund would NOT be used for General Ministry Fund expenses. At no time is the establishment of an Endowment Fund to replace the on-going General Ministry operations Fund or Debt reduction donations needed for day-to-day operations of the church. With a donation of $10,000 or more, the donor may designate that the earnings from your contribution be used for a specific purpose, with approval of the Endowment Team and the Administrative Council. We hope that you will consider making Mount Bethel Church a part of your estate planning options. Mount Bethel's Endowment is a means to donate money or property to carry out our Christian-defined goals of helping those in need and for our church to continue its ministry work beyond our lives. How is this different than a Memorial? A Memorial is a gift intended to remind us of someone (in memory of...), and usually used for the purchase of something physical for the church. A memorial of money or property may be placed in an Endowment for a farther reaching impact beyond our immediate Church requirements. Is this just another fund raiser? No, a fund raiser has an end and the funds are spent. The Endowment is structured to do Christian works in perpetuity and has no foreseeable end. The principal amount donated to the Endowment is never used. Only the future gains generated from the Endowment donations are used to do God's work. Cash, stocks or mutual funds can all be placed into the Endowment Fund. Donated property may be sold to incorporate it into the Endowment fund. Through cash gifts, through a bequest in your "will," or making the Mount Bethel Endowment Fund the beneficiary of a life insurance policy. Your Christian intentions will go on for many generations. How will requests for money be made? All external requests will be made by completing a request form (development in process) and may be made by a church member or someone outside the church. The Endowment Committee will meet at least quarterly to consider each request, gather further information, and approve requests that meet the criteria according to the funds available. At what point will we begin to spend the earnings? The Endowment Committee has chosen a goal of $50,000 before any earnings will be used. Can I give small amounts of money to this? Yes. It should be clearly designated for the Mt Bethel Endowment. Small amounts will be accumulated in a separate account. When the balance reaches a certain point, the funds will be moved into an appropriate investment. This will allow the committee to track the principal donation amount vs. earnings. Should it be part of my yearly pledge? No. The Endowment donations are not a pledge item. This should be in addition to your annual pledge/tithes. Your pledge is for the present daily budgetary, ministry needs of the Church. The Endowment is reserved for the future needs and growth of our Christian outreach. Won't it take forever to build a significant amount? It could be 1 year, or up to 10 years to become viable. It's up to the contributors to determine how soon we reach our goal, but it will happen, thanks to you. If I donate as part of an estate plan, does the Church need a copy of my will? No. Your "will" should clearly state what you want to donate to the Mt Bethel Endowment fund. Who will decide how the interest will be dispersed? The Endowment Team has guidelines in place and will meet regularly (at least quarterly) to consider the needs or requests. This information is not intended as a substitute for legal or tax advice. Any person considering a charitable gift, bequest or endowment should consult with their legal counsel and tax advisor before making such a gift. Remember Mt Bethel Church in your estate planning.